Holds nose and waves away supposed stink. 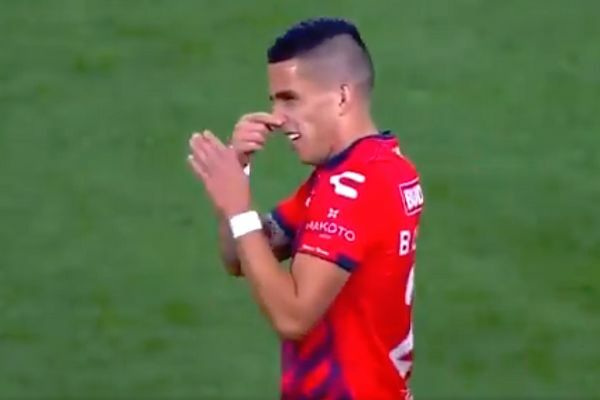 Veracruz midfielder Carlos Alberto Gutiérrez made out that Guadalajara’s José Van Rankin had bad breath as the two squared up in Tuesday’s Clausura fixture. After the players clashed heads during an added-time altercation at the end of a 0-0 draw, Gutiérrez recoiled holding his nose and waving away a supposed stink. It is unclear whether or not Van Rankin, a right-back on loan from Pumas UNAM, really did smell or if Gutiérrez was just doing it for effect. I hear that Van Rankin's mouth smells like 4 year old Taco Bell. Either way it appears to amuse the commentator, who chuckles while describing what’s going on. The goalless draw at the Estadio Omnilife left Guadalajara 5th in the competition’s standings after five games, while Veracruz lie second from bottom without a win.